Renovations, large or small, can be hectic and can require a lot of clean up afterwards. Here are some tips to get your house back-to-new (rather, better-than-new) in no time. For freshly painted surfaces, dry dust using a duster. Use a broom or extension duster to reach places that are high up or otherwise difficult to reach. Vacuum with a brush attachment. Wipe surfaces down with a damp cloth. Certain areas can collect a lot of dust during a renovation, including vents, air filters, and light fixtures. You may have to unscrew light fixtures and vents, and clean them with soap and warm water. Air filters may need to be replaced. Once dry dust is taking care of, via vacuuming and dusting, it’s time to mop up. For hardwood, and/or tiled floors, mop with warm soap and water. The same can also be done for other surfaces, and even walls, using a damp cloth instead of a mop. For wooden surfaces, once dry, you may want to use wood polish such as Murphy’s Oil. Cleaning up post-renovation is all about the details. The larger messes will be easy to notice, but the subtler dust, and hard to reach areas may go unnoticed. Ensure every nook and cranny of your home is free of dust, paying close attention to vents and air filters. When dealing with large amounts of dust, it’s important to protect yourself. Using a face mask and gloves while cleaning, will protect your skin for harsh cleaning products, and your lungs from dust and other chemicals. 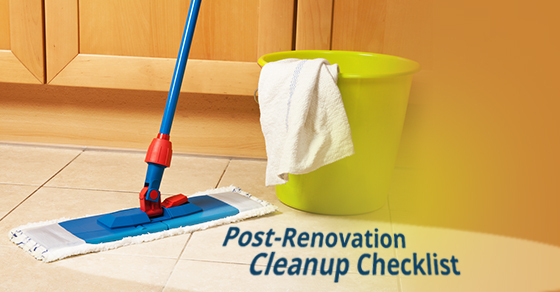 If you’re looking for help in your post-renovation cleanup, contact the team at Sunrise-Cleaning. One of our specialties is post-renovation cleaning, so we’re fully capable to take care to give your home the deepest clean possible so after the tumult of renovation, you can relax! Contact us today for more information.